Nokia stock jumps 21% in the last 5 days. Reason to be bullish? If you follow the stock market, today was an interesting day to be a Nokia investor as the stock jumped over 12% to close at $3.31 a share. For the last 8 weeks, Nokia’s stock has been hovering around the $2.65 mark—sometimes going up slightly, sometimes going down—but always around that price point. But for the last few days, it’s been creeping up with a big explosion today, actually peaking at $3.40 before coming down slightly before the close of the market. The reasons for the large increase appear to be tied to two events including positive news of the Lumia 920 sales and the launch of HERE on iOS. What’s funny is we’d argue both news items are rather inconsequential and if anything, not exactly great news. But backing up our theory that investors and business analysts are either completely misinformed, insane or both, the rise in stock while good for Nokia may be premature. Yikes. In other words, it’s not like iOS users are now in love with Nokia or that Google should be shaking in their boots. That’s not to put down Nokia too much either. We’re betting that the Finnish company probably rushed out HERE for iOS to take advantage of the Google-gap and Apple Maps failures and we can’t blame them for wanting to exploit the situation. In fact, it seems to have worked. Wall Street is responding well to the notion that Nokia may be more than a phone company, but one of services as well. The other news was based on a report that the Lumia 920 was sold out in Germany. The report is tenuous at best because we all know that the 920 is hard to find anywhere in the world due to shortage of supply, with demand playing an undetermined factor at this point. 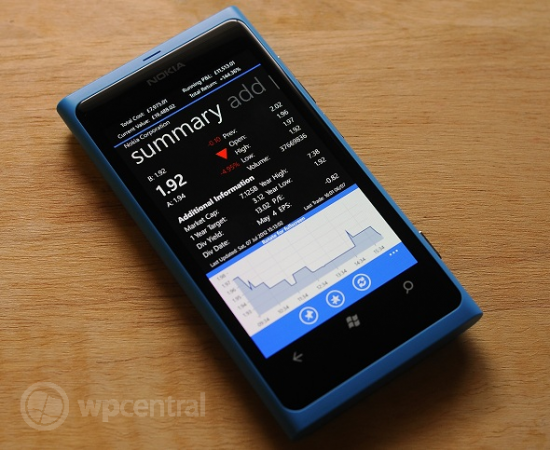 We’re not trying to rain on Nokia’s parade here as anecdotal evidence is certainly strong that the 920 is doing well. Just yesterday we were at our local AT&T store picking their brains on the topic and the conclusion is that while the HTC 8X is selling lightly, the 920 is piquing much more interest and sales. But no one knows just how many 920’s have sold and no one knows how many they would be selling if stock were readily available. But hey, those on Wall Street smell a winner in Nokia (even if it's based on dubious info) and it has reflected in a tremendous stock gains. That positive momentum is sometimes all that is needed to get things going—people hear that Nokia and the Lumia 920 are a “big hit” and it becomes self-reinforcing. Next thing you know, the 920 is the big must have item for the 2012 holiday season.